Located in Hartlepool occupying 100,000ft manufacturing area, Bridgman is one of UK largest prime door / washroom cubicles and panel products manufacturers with some of the shortest lead times in the cubicle industry. 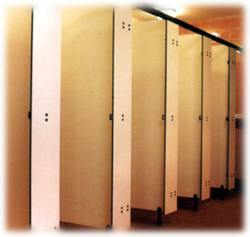 Nationwide supply with over 20 years experience, 3 year guarantee on all washroom cubicles products. Choose from our Speedwall 1, Speedwall 2, Compact Grade and Speedfit cubicle ranges. Wide choice of finishes and colours – twenty standard plain colours including custom pattern finishes. Complementary products – complete range of colour matched vanity systems, seating, ducting, wall panels and column cladding. Click here to download the Bridgman IBC brochure as a PDF file. A quality modular range with an extra choice of cubicle colours and finishes plus matching postformed vanity units and washroom products – yet the same guaranteed quality and cost effectiveness. Very popular system offering considerable flexibility, design potential and durability for all modern business, industry and public sector installations. The ultimate solution for the heavy-use, high traffic areas subject to casual abuse or vandalism, or constant wet and humidity. Compact Grade delivers premium protection in every demanding environment.